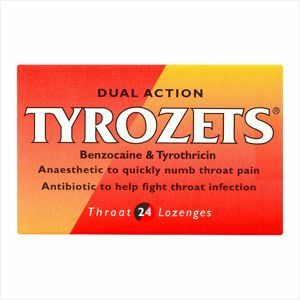 Tyrozet lozenges provide rapid relief for sore throats and minor mouth irritations. The unique double action formula contains an antibiotic to help fight throat infections and an anaesthetic to quickly numb sore throat pain. Tyrozets Dosage: Adults and children aged 3 years and over: dissolve one lozenge slowly in the mouth and repeat every three hours. Adults must not take more than 8 lozenges in 24 hours; children aged 3 years and over should not take more than 6 lozenges in 24 hours. If symptoms persist for more than five days, consult your doctor. Lozenges for oral use only. Please see leaflet for further information.